Expressionist artist Kurtis Brand is auctioning off a considerable number of paintings stored here in Newburgh, NY. Kurtis lives in Guatemala however created many of these works while living in Beacon, NY. NEWBURGH, N.Y. - Oct. 17, 2017 - PRLog -- Auction / Sale Beginning Now through December 1st, 2017. Bid Now for Dec. 10th-16th pick up or shipment, or Buy Now at http://kurtisbrand.com/auction. 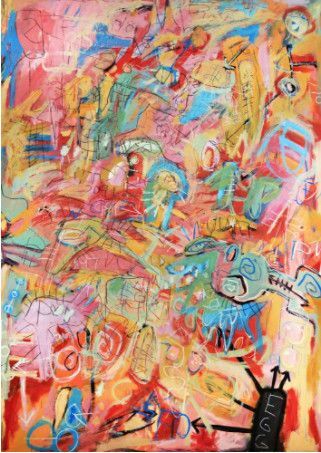 Kurtis Brand's archived work is mostly contemporary abstract 2-D paintings in a variety of sizes and subject matter, using acrylic and pencil. View the works at http://kurtisbrand.com/auction/ and bid or buy. This is an incredible opportunity to find excellent original wall art at unheard of prices. All works are housed in a climate controlled secure storage locker is located in Newburgh, NY. Works can be purchased until December 1st. All of the proceeds from this auction / sale will go to the development of Brand's new Guatemalan series launching in 2019. Kurtis Brand's work is often about questioning the way we see things and our perception of the world around us. To see deeper into the nature of life and expressing certain realizations. Brand's art reflects daily life. States of mind, relationships, objects surrounding him, sounds, ideas; all arising from experience. Ideas are formulated into conceptual and contemporary abstract wall pieces and sculptures. United States, (1968 - Present) Originally from Cincinnati, Ohio, based in Guatemala.